The #Samsung Galaxy #Note4 although having a large 5.7 inch display and powerful processor can still be used for more than a day thanks to its 3220 mAh battery. Several tests conducted on the #Galaxy Note 4 shows that its battery is able to last for 28 hours on 3G calls, 10 hours on web browsing, and 17 hours on video playback. These numbers were taken when the device is fully charged. 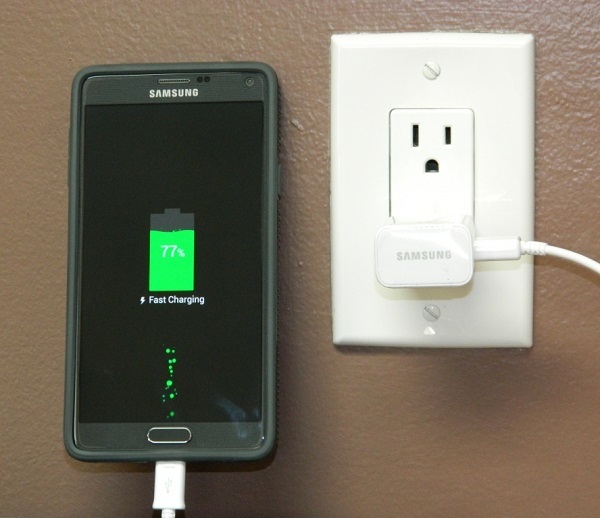 But what if you have a Note 4 that won’t fully charge? You will definitely experience a decreased usage time which is a disadvantage. This and other related issues are what we will tackle in this latest part of our troubleshooting series. Problem: Hi, recently I bought a Samsung Galaxy Note 4 (AT&T) but I am using it on Straight Talk. The first 4 or 5 times it charged perfectly but now it only charges to 91% or 92%, even if I charge it all night. I have drained the battery already to 0% then charged it all night while it was powered off but it still didn’t charge fully. Is my battery bad or is it a hardware issue? And I would also like to upgrade my software, but when I check for software updates it just stays by the CHECKING FOR SOFTWARE UPDATE screen even if I wait a couple hours. Thanks for any help you can give me! Solution: Draining your battery to 0% then charging it back fully is one way of dealing with this issue. This is usually done when you want to recalibrate the battery and usually works to resolve this problem. In this case however the problem still persists which makes me suspect that this may be a software related issue since you also mentioned that you just recently bought the device. Before proceeding with the troubleshooting steps listed below make sure to use the charger and USB cord that came with your phone. You should also clean the charging port of your phone if you spot any dirt or lint on it. Try to check first if an app installed in your phone is affecting your phone’s battery metering ability by starting the device in Safe Mode. In this mode only the default apps are allowed to run while the apps that you installed are disabled. Charge your phone in this mode. If it reaches to 100% then the issue is most likely caused by an app. Find out what app this is and uninstall it. If you still can’t fully charge your phone even in Safe Mode then your next suspect as to why this issue is happening is a corrupt cached data. You will then need to wipe the cache partition of your phone to check if this is the case. If after wiping the cache partition the issue still remains then you need to backup your phone data and do a factory reset. Regarding the issue of your phone not able to get any software updates this may be because the phone is an AT&T device which is being used under the Straight Talk network. You should try to connect your phone using a USB cord to a computer running on Kies. You will be notified of a software update once your phone is detected. If you still can’t update your phone this way then the other alternative is to borrow an AT&T SIM and insert in in your device so that you can get the latest software update. Problem: Ever since I installed an app this morning, the battery in my phone went way down to somewhere around 10% when I looked at it at lunch at about 11:30 am. However, that wasn’t nearly as bad as when I tried to plug my phone to charge it while I ate. It would not charge even with the fast charger it came with. I still could not charge it when I arrived home later. So I looked around on the internet on my computer trying to find out what would cause this and/or what I could do. I saw one something on your website about trying to plug my cell phone into my computer, so I did. It appears to being charging a little, but using the phone to do anything knocks the percentage of battery charge down. I have not tried charging it the regular way (into the wall) since before I plugged the phone into my computer. Help, please! Solution: Charging this device on a computer is a slow method of charging since the USB port of a computer has a very low power output. The best way to charge a device is by using its wall charger however in this case your phone does not seem to be able to charge with it. To troubleshoot this issue you need to check first the charging port of your phone and see if there are any signs of dirt or lint. If you spot any then clean it using a can of compressed air or cotton bud dipped in alcohol. In most cases the reason why a phone will not charge is because of a broken USB cord. Try replacing this cord and see if you are now able to charge your phone. You should also try using another wall charger and see if this resolves the issue. There are also some cases where a software glitch may cause your phone not to charge which is what we will also be checking. Remove your phone battery then press and hold the power button for at least a minute. This drains your phone circuit of any residual charge and clears out its RAM. Reinsert the battery then charge your phone using the wall charger and check if it will now charge. If the issue persists then I suggest you backup your phone data then do a factory reset to eliminate any software related problems that may be causing this issue. If the factory reset fails to resolve the issue then try replacing your phone battery with a new one. Problem: Bought a second battery to have as a back up when I put it in my device it was at 1% power and would not go any farther. I went to my settings and turned off the fast charging feature and it charged fully in about 5 hours. After the new battery drained I tried charging it again it made it all the way to 70% and no further. Its not my cord or the port as my original battery charges fine. Any suggestions? Solution: Try to recalibrate the battery first by draining it again then charging it fully or up to the maximum percentage that it can reach. Repeat this method a least twice. If the battery does not reach 100% capacity and yet the original battery of your phone can reach 100% then there may be a problem with the new battery you bought. Is this an original Samsung battery? You should try to have it replaced. Problem: Phone will not stay charged. Downloaded clean master and it pops up all the time to clean, and system is too hot. I have talked to tech support and.. nothing. Also screen will not stay locked in my pocket, purse etc. Thanks for your time and help. Solution: You need to check first if this is a software related issue by backing up your phone data then doing a factory reset. Once the factory reset is done then connect your phone to the wall charger and let it charge. Once it reaches 100% capacity then check your phone operation. In case your phone does not charge then check its charging port if there are any signs of dirt or lint. Use compressed air or cotton bud dipped in alcohol if you need to clean the port. You should also try to replace the USB cord as this usually gets damaged easily. You should also replace the wall charger just in case this is the cause of the problem. If you are still having issue with your phone then try getting a new battery. Problem: Once my drains to 15% it will either start rebooting over and over again until I either plug it in or pull the battery. Or it will station to 0 and shut off in just a couple of minutes. When I plug my charger in it will show 15%. Solution: It looks like this may be a software related issue. You need to backup your phone data then do a factory reset. Once the factory reset has finished check if the issue still occurs. I recently bought Samsung galaxy Avant but the problem is it cant charge up to 100% capacity. Always 92 and 93% so please help me out. Fast charging won’t work on my note 4, any ways off troubleshooting the port to see of that’s the issue? I bought 2 stock wall chargers and 2 stock cables, and the problem still is there. My average charge time for my note 4 is aprox 7 hours.